Microscope World has a full page dedicated information on how to parfocal microscope objective lenses here. 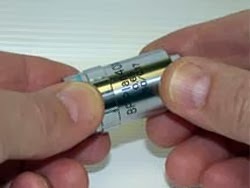 A parfocalled microscope objective lens means that on a biological microscope when you move up in magnification from one objective lens to the next the specimen remains in focus. Remove the objective lens from the microscope. Unscrew and remove the outer covering from the lens. 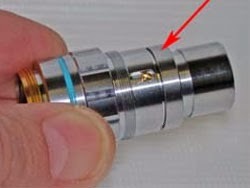 Once the cover is removed, you will notice a small screw that, when tightened or loosened, will adjust the distance between the tip of the lens and the threads on the top of the lens. With the cover still removed, screw the objective lens back onto the microscope. Move down to the lower objective lens power and ensure that the objective is in focus when looking through the eyepieces. Move back to the lens that needs to be parfocalled. Rather than turning the focus knob to focus the lens, adjust the small screw on the side of the lens until the image is crisp and clear. 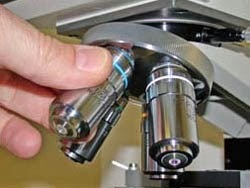 Remove the microscope objective from the microscope, replace the metal cover on the lens and screw the lens back into place on the microscope. Learn more about how to parfocal microscope objective lenses here.